Following the defeat of CyberFace and the rebuilding of the United States, a new incarnation of the Special Operations Strikeforce was put together to serve and protect the nation. 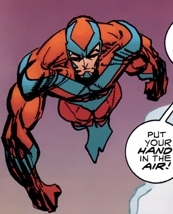 Warhawk was one of the new recruits for the team and served with them to deal with such threats as the Vicious Circle, the Forever Serpent and the Nuclear Man. The S.O.S. became part of the superhuman army that Mister Glum commanded when he conquered the planet, instructing them to deal with his enemies like Dragon and the Atlanteans. Warhawk was then part of a team assembled to apprehend Emperor Kurr but the entire unit were slaughtered, Warhawk getting shot to pieces by the villain.